There are some albums that unfold as a collection of short stories, others more like a novel. 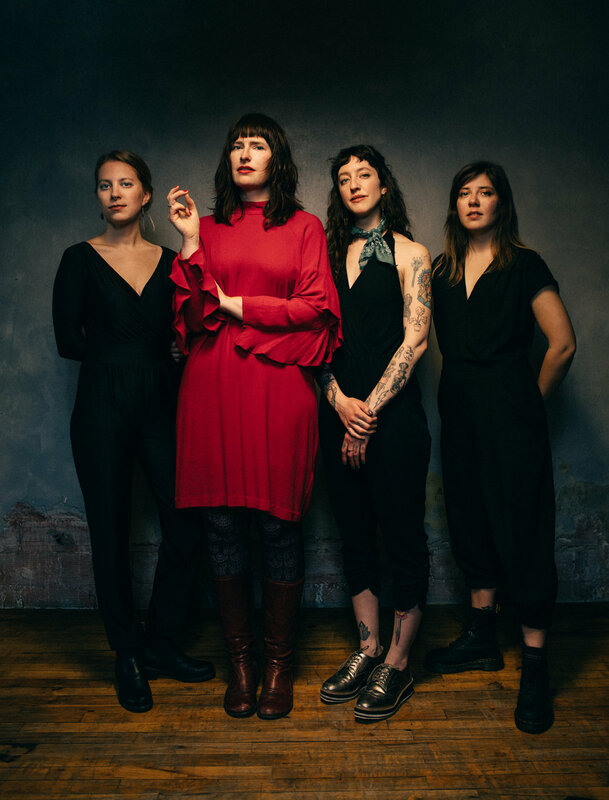 With To Love To Leave To Live, Minneapolis-based Her Crooked Heart presents a debut record unique in form, made up of cyclical narratives and intertwining histories, each informing the next. The band conceived of and led by multi-instrumentalist, songwriter, and producer Rachel Ries is indifferent to expectations of genre and instrumentation. To Love To Leave To Live presents a vast and varied soundscape of textural elements layered over live trio performances. The result is a transformative song cycle, led by a charismatic personality, relishing in both the pain and joy of destruction and rebirth. Cyclically, and without judgement, the stories inform one another and continue on and on: ...ve to live To Love To Leave To Live to love to lea... “This album explores the infinite cycle of burning your life to the ground in order to recreate it”, says Ries. “I’ve had to love and learn to leave in order to get closer to who I am”. The orchestration, arrangements and production of To Love To Leave To Live move the record out of any easily definable genre and into a space that pulls from Ries’ many different musical and life influences. When searching for a co-producer, Ries followed a hunch and reached out to an acquaintance from the road. In Wisconsin based multi-instrumentalist and producer Shane Leonard, she found an agile and wildly curious co-producer and together they enlisted several collaborators whom she’d also met on the road; some while touring with Anaïs Mitchell: engineer Brian Joseph (Sufjan Stevens, Paul Simon, Blind Boys of Alabama), Rob Moose (yMusic, Bon Iver, Alabama Shakes) for string parts, Mike Lewis (Bon Iver) on saxophone, and Alec Spiegelman (Cuddle Magic) on woodwinds. To complete the sonic picture, they enlisted bass player Pat Keen, horn player John DeHaven and pedal steel player Ben Lester (Tallest Man on Earth, S. Carey). In true commitment to the cyclical nature of growth, Ries’ siblings David and Sarah, add their harmony vocals to the mix. The subject matter and arrangements of the songs work closely together, illustrating distinct chapters of Ries’ journey. “I Fell In Love” calls upon all of Ries’ classical training with its baroque song cycle, steadily and determinedly resolving its way through three key changes; the piano kept in line with the underpinning structure of a jazz trio. “Courthouse” finds the narrator lost in the behemoth Kings County courthouse in Brooklyn, attempting to file divorce papers “if I’m a sinner then I was a saint/but really I’m just a lady taking back her name/if you’ll forgive me maybe I’ll forgive me too/but until then I’m gonna see this through” sings Ries. This same song recalls her Mennonite church origins with its hymnal and harmonized outro and the repeating line “heaven help us all”. You can hear the dark danceability of Fiona Apple’s Tidal and the bursts of backup vocals in the vein of The Ronettes. In “For A Song”, she declares “I’m just trying to build / a house where music lives / where I can live a long, long time for a song”. Fueled by building a cottage in her brother’s backyard, the track is a quiet, roots-infused anthem for all who need a reminder that it’s ok to build the life you want; the life you love. It’s valiant to make space for one’s creative pursuits; for the Muse. Ries’ years in youth orchestra, with violin and viola alternately propped beneath her chin, inspire the collaborations with Rob Moose and Alec Spiegelman on the chamber arrangements for “Letters”, “Pleasant Valley Reservoir”, and “Young Love is Like Nothing”. But her more recent commitment to meditation takes center stage in “Windswept”, which has a harmonized meditation mantra built into it: "let it all go and come back to you." The erie and comforting soundscape conveys the relief of the mind finally, albeit temporarily, at rest. To bring these songs and this record to the stage, Ries has enlisted a powerful group of women. The quartet blends classical and electric guitar; piano and vintage synths; cello, woodwinds and drum triggers. Although there is a merging of both acoustic and synthetic sounds, the arrangements are all in service of the voice: four part vocal harmonies are at times ethereal, at times an elemental wail, but always telling a story. Ries has curated a group who, in their way, can take on the feminine and humanist mantle of Her Crooked Heart and make it their own; infusing it with their own truths and lived experiences.